Born: 29 March 1793, Exeter, Devon, United Kingdom. Died: 28 March 1851, Eltham, Kent, United Kingdom. Charles Cornwallis Michell was baptised Charles Collier Michell, but later changed his second given name. His father, Sampson Michell, rose to commander-in-chief of the Portuguese navy. Charles enrolled as a cadet at the Royal Military Academy at Woolwich (London) in April 1807 and was trained as a military surveyor. He was commissioned as a second lieutenant in the Royal Artillery in October 1809. The next year he was seconded to the Portuguese Army, placed in command of a brigade of artillery and served with distinction in various conflicts. Following the battle of Toulouse, in which his brigade was attached to the Spanish army, he eloped with a 14 year old French girl, Anne d'Arragon, and married her on 10 October 1814. They eventually had four daughters. Michell was promoted to Captain in the Royal Artillery in September 1817. 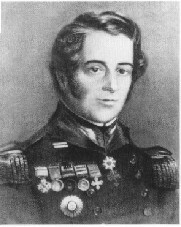 After his return to Portugal he accompanied Marshal W.C. Beresford to Brazil in 1820 and then retired on half pay to Nantes, France. His financial position was precarious, but in March 1824 he obtained a post as military drawing master at the Sandhurst Royal Military Academy in England. In 1825 he became professor of fortifications at the Royal Military Academy at Woolwich, and in January the next year was promoted to major. In 1828 Michell was appointed surveyor-general and colonial civil engineer at the Cape of Good Hope, where he arrived on 21 October with his family. As colonial civil engineer he succeeded Henry W. Reveley*, who was the first to hold this post. His main concern as an engineer was the state of the roads, which required extensive reconstruction for which there were insufficient funds. Soon after his arrival the governor, Sir Lowry Cole, directed him to draw up plans for a new pass through the Hottentots Holland Mountains, on the road to Caledon. Michell submitted his report in December 1828. Convicts were used to carry out the work and the pass, named Sir Lowry's pass after the governor, was opened in July 1830. It was the first properly constructed road pass to be completed in southern Africa. Continuing on the route towards Caledon, the Houhoek pass and the road to it were repaired under his supervision by April 1831. A few years later he published a paper, "On the roads and kloofs in the Cape Colony", in the Journal of the Royal Geographical Society (1836, Vol. 6, pp. 168-174). In his role as Surveyor-General Michell drew up a proposal for an improved survey of the colony. However, many years would go by before an accurate, large scale trigonometric survey of the colony was instituted by Dr David Gill*. From 1834 Michell required new surveyors to pass an examination at his office. This ruling was applied retrospectively to all surveyors in 1836. It appears that he was not very effective in his role as Surveyor-General, because the slow pace of surveying and granting of title deeds to farms in the frontier districts is recognised as one of the causes of the Great Trek. However, he managed to compile about 23 maps of portions of the Cape colony and Mozambique during his stay at the Cape. Some of these related to the Sixth Frontier War (1834-1835), others were for the use of prominent visitors to the colony or expeditions into the interior. In the South African almanac and directory for 1829 Michell is described also as civil architect and superintendent of [public] works. In his role as architect he designed and supervised the building of St Paul's church in Rondebosch, Cape Town (opened in February 1834), and probably also designed St John's church at Bathurst (1837) and the commercial exchange at Port Elizabeth (1838). Soon after his arrival at the Cape, in June 1829, the South African Institution, the first purely scientific society in southern Africa, was founded in Cape Town. Michell served on its council from the start. When the Institution amalgamated with the South African Literary Society in 1832 to form the South African Literary and Scientific Institution, he continued as a member of council for several years, and served also on its statistical committee. In 1833 he was a member of the management committee of the Cape of Good Hope Association for Exploring Central Africa, and of the sub-committee that did the planning for Dr Andrew Smith's* expedition into the interior. He furthermore promised to prepare a map for the expedition's use. During the Sixth Frontier War, which broke out in December 1834, Michell served as assistant quartermaster-general to the staff of governor Benjamin D'Urban, and made valuable surveys and sketches of regions in the Eastern Cape. These were sent to England, where the information they contained was later used in a map of the eastern frontier published by John Arrowsmith in 1848. After the war he was honoured for his services as a Knight of the Hanoverial Order (KH) by King William IV of England. During 1838-1839 he spent eighteen months in England on leave, during which he requested permission from the colonial office to build two passes and construct a lighthouse at Cape Agulhas, but permission was refused because of a lack of funds. He did, however, design the lighthouse that was later built at Cape Agulhas (1848), and managed to have a lighthouse completed at Mouille point, near Cape Town, in 1842. Meanwhile he was promoted to Lieutenant-Colonel in November 1841. However, from about 1838 he was in poor health. Road construction at the Cape was given a boost by the appointment of a central road board in 1843, with Michell as one of its members. The board appointed the necessary technical staff and organised convict labour for road construction. Their first project, planned and supervised by Michell, was the construction of a much needed hard road across the sandy Cape Flats for a distance of 35 km between the Salt and Eerste rivers. The road was completed towards the end of 1845. Meanwhile Michell had planned Montagu pass, through Cradock's kloof in the Outeniqua Mountains, to provide a proper road link between George and Uniondale. The pass was built by an Australian road engineer, Henry F. White, and opened in January 1848. Michell also planned a pass following the Breede River through the Skurweberg from the Tulbach valley to Ceres, to replace an earlier track through the mountains. He had first surveyed this route as early as 1830, but no action was taken at that time. The work was carried out between October 1845 and November 1848 by Andrew G. Bain*. The pass was named Michell's Pass after its designer (originally Mitchell's pass, using an incorrect spelling of his surname). Michell's planning of roads and passes over a period of twenty years contributed significantly to making the interior of the colony more accessible and speeding up its development. Michell was an accomplished draughtsman, landscape artist, and engraver. His most dramatic engraving, titled The state of Cradock's pass in 1840, shows an ox-waggon struggling up Cradock's Kloof. Several of his sketches of South African scenes and people were used to illustrate the book, Narrative of a voyage of observation among the colonies of Western Africa ... and of a campaign in Kaffirland... (1837), written by his son-in-law, J.E. Alexander*. In recognition of his earlier service in Portugal the queen of that country wished to confer on him the Order of St Bento D'Avis in 1844. However, the Secretary of State in London initially refused permission for him to accept and wear a foreign order. Permission was later granted and the order was conferred in 1845. By 1846 Michell was the Consul-General of Portugal in the Cape Colony. He was a popular person, but constantly sought the limelight. He had musical talents, and was fluent in French, Portuguese and English. Following a severe stroke (or heart attack) he was granted a year's leave and left for England in February 1848. His health deteriorated further and he resigned his post in July that year. Cape of Good Hope Association for Exploring Central Africa, Managing Committee. Abstract of Proceedings. Capt Town: George Greig, 1833. Kennedy, R.F. Catalogue of prints in the Africana Museum... up to 1870. Johannesburg: Africana Museum, 1975-1976. Liebenberg, E.C. Die topografiese kartering van Suid-Afrika, 1879-1972; 'n histories-geografiese ontleding (p. 101). MA-verhandeling in Geografie, Universiteit van Suid-Afrika, 1973. National Automated Archival Information Retrieval System (NAAIRS). http://www.national.archives.gov.za/naairs.htm Documents relating to Charles Cornwallis Michell / Major Michell / Maj Michell / Lieutenant-Colonel Michell / Lt-Col Michell. Oxford dictionary of national biography. Oxford University Press, 1904. Richings, G. Chares Cornwallis Michell (1793-1851), pioneer Cape military cartographer. Retrieved from https://history.icaci.org/wp-content/uploads/2016/09/Richings.pdf on 2018-10-25. Smit, J.J. Die paaie, passe en rivieroorgange in Suid-Kaapland, 1806-1858. D. Lit. et Phil. proefskrif in Geskiedenis, Universiteit van Suid-Afrika, 1975. Snape, A.E. Pioneer engineers of the Cape. Architect, Builder and Engineer, September 1928, Vol. 12(2), pp. 21-22. South African almanac and directory (title varies), 1829, 1832-1837. South African Commercial Advertiser, 25 June 1831, p. 2: South African Institution; 18 July 1832, p. 1, and 20 July 1833, p. 2: South African Literary and Scientific Institution. South African Literary and Scientific Institution. Regulations... (p. 4, list of office bearers). Cape Town: George Greig, 1832. South African Quarterly Journal, 1829/1830, No. 1, p. 82: Proceedings of the South African Institution, June 27th, 1829.